Now that it’s February, it’s time to write a wrap up post for this year’s L.M. Montgomery Reading Challenge. This year, I read only one book: The Blue Castle, which was also this month’s selection for the Reading to Know Classics Bookclub. That would have been all I did for the L.M. Montgomery Reading Challenge, except that I took some time Saturday (I know, not in January at all) to stitch up another article of clothing for Anne’s wardrobe. To see what others have been reading and doing for the challenge this past month, check out the L.M. Montgomery Reading Challenge at Reading to Know. In addition to the L.M. Montgomery Reading Challenge, I have been trying to sneak in at least one book for the Armchair Cybils, which will be finishing up in the middle of February. Amy wrote a fantastic review of Elizabeth Wein’s Rose Under Fire–and that title just happened to be both a Cybils finalist AND in my local library system. I’ve been devouring it. It is SO good. Rose is an American pilot who’s in the British Air Transport Auxillary, transporting planes from factory to field and back–until she finds herself landing in enemy territory and is taken to the Ravensbruck work camp where she meets a whole host of other interesting female prisoners. One particularly interesting note for me was the early mention of (even obsession with) the German V1 “buzz bomb”. When my parents came down to Wichita to visit us last fall, we went to the Cosmosphere in Hutchinson–which has an enormous museum on the history of space. The first room included a V1 buzz bomb and gave a history of it–which made reading about it in a novel all the more fun. 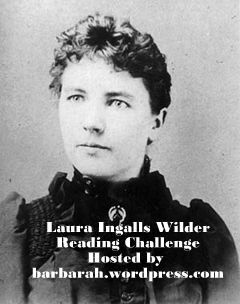 Finally, I’m going to be participating in Barbara H’s Laura Ingalls Wilder Reading Challenge this month. I plan on reading Little House on the Prairie (also this month’s selection for the Reading to Know Book club) as well as a number of biographies of Laura (as many as I can manage of the half dozen or so that I checked out of my local library). So those are the reading challenges I’m participating in this month (or finished from last month.) Are you participating in any challenges this year? What are they? Does anyone else accidentally call this the “Anne of Green Gables Challenge”? I know that L.M. Montgomery has written other things. I’ve read those other things (all that my library owns, at least). But “Anne” will still (and always) be my favorite and the first to pop into my mind when L.M. Montgomery is mentioned. And so, this year, I read Anne. Anne 1 and Anne 2, otherwise known as Anne of Green Gables and Anne of Avonlea. And I made one more piece for my small collection of Anne paraphernalia. This year, though, I’m doing something special. I’m making a second of this lovely carpet bag to share with ONE OF YOU! That’s right. I’m giving one of these away. If you want to win, simply post a comment below. I’ll be keeping the comments open until February 10 (because surely I’m not the only one who sometimes takes FOREVER to get around to all the link-ups in a challenge like this!) and will draw a name from among the commenters on the tenth. So now, get commenting–and get yourself over to Carrie’s L.M. Montgomery Reading Challenge page to see what others did for the challenge! Carrie has official sounded the closing bell for the L.M. Montgomery reading challenge–declaring that it’s time for everyone to link up. The bell caught me by surprise, with plenty left unfinished. Despite frantically reading a bit more this afternoon, I am still not through with Anne of Green Gables. I did, however, read and review Much Ado about Anne by Heather Frederick Vogel. I also wrote some reflections on a quote from Anne of Green Gables. But I did not complete the first piece of the project I had hoped to unveil at the end of this challenge. When I was young, the American girl dolls were all the rage (I guess they still are in some circles). In those days, the company that made them was called “Pleasant Company” and the only dolls you could get were the historical ones that had short chapter books that went along with them. I got “Addy”, a young girl who escaped slavery via the Underground Railroad (chronicled, of course, in Meet Addy), when she first came out. And I spent hours poring over the Pleasant Company catalog, with its outfits and accessories that matched the books. I was simultaneously in love with Frances Hodgson Burnett’s A Little Princess. I adored how Sara Crew and her indulgent Papa went to pick out the doll “Emily” and outfit her in the very fanciest of clothing. I dreamed of a wardrobe for my doll, a complete set–and one that matched a book. But the Pleasant company outfits were much to expensive for my (or my parents’) budget, and I had little patience to do any quality sewing in those days. So I made do with the clothes Addy came with–and the few garments Mom made for her. But I still dreamed of a complete wardrobe, based on a book. I grew up a bit and decided that I wanted it to be based on a REAL book–not books that were written in order to sell doll clothes. It was perfect. Anne was the right sort of age, Montgomery goes into detail about her clothing and accessories, and I just happened to love the series. I would make a complete wardrobe for Addy using the Anne series as a starting point. I started collecting bits and pieces of fabric that might be suitable for the project. And, this month, I started sewing. “Well, how do you like them?” said Marilla. Anne was standing in the gable room, looking solemnly at three new dresses spread out on the bed. One was of snuffy colored gingham which Marilla had been tempted to buy from a peddler the preceding summer because it looked so serviceable; one was of black-and-white checked sateen which she had picked up at a bargain counter in the winter; and one was a stiff print of an ugly blue shade which she had purchased that week at the Carmody store. She had made them up herself, and they were all made alike–plain skirts fulled tightly to plain waists, with sleeves as plain as waist and skirt and tight as sleeves could be. “I’ll imagine that I like them,” said Anne soberly. Perhaps it’s a bit of a depressing place to start, but that is where I have started. And this is what I have so far. Nothing exciting, but it’s a start to this project I’ve been dreaming of for nigh on 15 years. 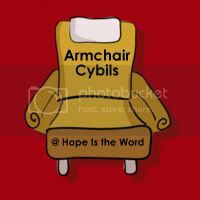 Visit Carrie’s L.M. Montgomery Reading Challenge to see what others were saying/doing about L.M. Montgomery this month.